The LeafFilter brand is a top-rated patented gutter-guard system which uses a stainless steel mesh that is able to stretch across the type of your gutters, either while the gutters are being installed for the first time or over an existing setup. The company claims they are number one due to a variety of reasons, including being the reliable long-term solution, great for all four seasons. Also, its warranty, which doesn’t void your roof warranty, its lifetime guarantee, customer support, patented design, and installs are also some of the many reasons why the company has multiple five-star reviews from its past customers. With the LeafFilter system, you can avoid many common gutter problems and damaged with its one-of-a-kind gutter guard solution. How much does LeafFilter gutter protection cost? 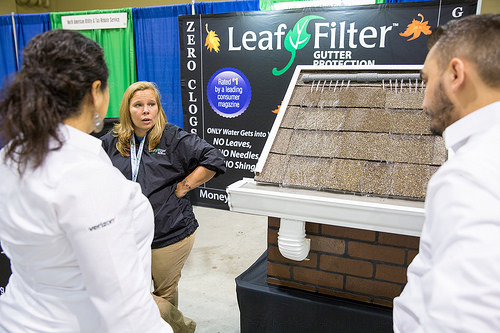 The costs of the LeafFilter system, according to the official website, will greatly depend on your gutter type, the number of inside/outside corners, the amount of materials needed (measured in linear feet), the condition of your gutters if being installed on an existing setup, the number of levels and other variables. Because of this, the company recommends you contact one of their representatives, and from there, they will be able to assess your current gutter system and recommend the best course of action. This entire quote can be done in less than 15 minutes and you can get an estimate by filling out a form on their website. The official company, at this time, does not offer any pricing estimates, but we were able to find some quotes online, ranging anywhere from $22 to $28 per foot. On this City-data.com forum thread, for example, a few members talked about the quotes they received. One member said he was quoted $5,100 for about 160 feet of gutters, while another was quoted $20 per linear foot for just the system. According to the multiple reviews on Roofery.com, they rated it as dead last when compared to other gutter guard brands. On two of the reviews, one member said he was initially quoted $16,000, but the quote was dropped to $8,000 almost immediately, while other member said he paid $6,000 for a job, both of which were unknown as to how long the gutters were. As for just the materials, the company will not sell you the materials direct, but at the time of this publishing, we were able to find LeafFilter Brand Premium gutter guard material for about $7 per five feet on eBay. Its award-winning, patented technology, according to the company, is made of three parts: its micromesh filter, which is considered to be so fine, that debris, even as small as sand, will not make its way into the gutter system. Its vinyl frame, designed to divert this debris over the drip edge and keep your gutters clean all year long is almost invisible when standing on the ground. Lastly, the reinforced hangers, designed to provide strength, ensure your new gutter guards stay in place during any inclement weather scenarios. The first step includes the inspection, a process where a professional will come to your home in order to measure your gutters and make recommendations. With these recommendations, you can review your options, ranging anywhere from just the LeafFilter system to complete system including new gutters. When you agree to the quote the company offers and you sign your contract, they will set an install date. As for the install process, the company uses a three-step process to make sure your gutters remain clear and clog-free for the entire life of your home. The first step involves cleaning, realigning and repairing your existing gutters to prep them for the LeafFilter system. Next, the second step involves sealing and prepping your gutters to prevent any leaks and reinforce your entire system with internally hidden hangers. Lastly, the LeafFilter will be installed to your existing gutters. Beware of the high pressured sales tactics from the company as we read many horror stories online with homeowners claiming the sales representative wouldn’t take no for an answer. If you want to save money and you want to use this product, it appears if you continue to say no or even haggle, you can often drop the initial quote you’re given by more than 50%. The company, as per the official website, does offer a 0% financing option, with payments as low as $35 a month. Consumer Reports, in an older issue, highly recommended installing the CR Best Buy Amerimax 85198 or 854054 as this could save you thousands, even if you were to hire a contractor. While the system was rated highly, it was only a “middling at containing a severe downpour,” according to the magazine.